Shoal is very proud to congratulate our engineers Jase Berry and Lam-Thien Vu who have been awarded the Next Generation Conference Scholarship by the Australasian Railway Association (ARA). “I am pleased to announce the rail graduates who have been selected for their innovative ideas on how they could market and promote the rail industry in a positive and impactful way,” said Danny Broad, Chief Executive Officer, ARA. Jase and Lam-Thien developed a plan to use video and storytelling from members of the Australian community to communicate the rail industry’s use of leading-edge technologies, sustainability, safety, superior user experience offerings, and prospective career opportunities. The plan is an empathetic approach to connect through the viewer’s emotion and logic. 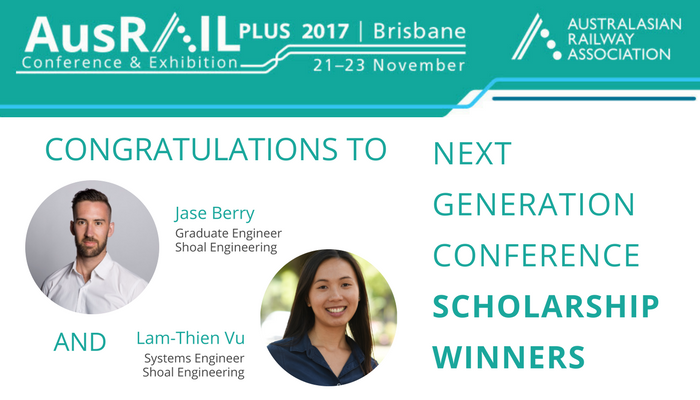 As Scholarship Winners, Jase and Lam-Thien (amongst other Shoal staffers) will be present at the three-day AusRAIL PLUS Conference at the Brisbane Convention and Exhibition Centre this November. Other scholarship recipients were also announced on the AusRAIL and Australasian Railway Association websites.